The JAXA ASTRO-H mission, headed by Professor Takahashi, is the 6th Japanese satellite to observe the sky in the low-energy X-ray and gamma (γ) fields. It carries 4 types of telescopes operating in a band of energy ranging from 0.3 keV to 600 keV, and allows to observe the phenomena of high energy in the distant Universe, like material swallowed by black holes, Galaxy clusters, or matter at extreme temperatures Several tens of millions of degrees). Astro-H, thanks to the SXS, is the first mission X to obtain spectra between 0.3 and 12 keV with a resolution of a few eV, and to image the sources of these emissions. X between 0.3 and 600 keV, which is indispensable for the study of compact objects, black holes or neutron stars. Finally, thanks to the high-energy instruments, the HXI and SGD telescopes, the polarization of the X light from the brightest sources of our Galaxy can be measured. The Soft X-ray Spectrometer (SXS) covers the band from 0.3 to 12 keV with a spectral resolution (<7 eV) unmatched to date. This instrument consists of a mirror focusing the X-rays on a matrix of microcalorimeters X working at 50 mK. 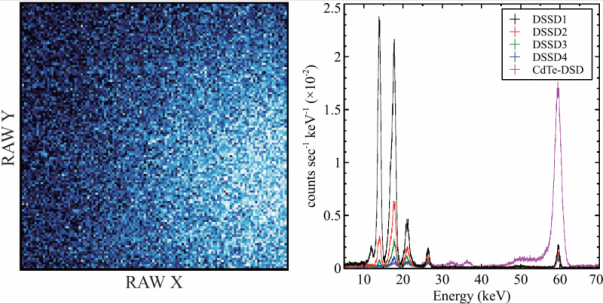 The soft X-ray imager (SXI) covers an energy band similar to that of the SXS with a larger field of view but a lower spectral resolution (150 eV to 6 keV). The detector is a CCD X similar to those used in XMM. The Hard X-ray Imager (HXI) is a hard X-ray telescope, similar to NuStar, which covers the 5 - 80 keV band, thanks to a hard X mirror and a combination of detectors Stripped with silicon and CdTe. The satellite has two identical HXIs. The detectors are placed on an extensible mat to reach a focal length of 12 m.
The Soft Gamma-ray Detector (SGD) is a Compton mini telescope based on stripped Silicon and CdTe detectors, which allows to extend the observations of the sources targeted by the X-ray telescopes, At 600 keV. NASA (GSFC) has agreed to provide the hard X mirrors and microcalorimeter. These instruments were placed on a satellite in low orbit (LEO) at 550 km altitude and 31 ° of inclination on 17 February 2016. Unfortunately Hitomi, after an attitude error, went into Survival mode since March 26, 2016. On April 28, the JAXA declared the mission lost. The Cluster of Galaxies of Perseus. The binary X IGR J16318-4848. The rest of supernova G21.5-0.9. The rest of supernova N132D. The isolated neutron star RXJ1856-3754. A supply of on-board equipment, such as, for example, High Voltage Flight Sources (HVPS), BGO crystals for anticoagulation of HXI and SGD, platinum sheets for hard X mirrors. Technical support including AIM and APC laboratory experiments on the spatial environment of HXI and SGD CdTe detectors and their associated electronics. Support to the European scientific community in the form of a user support at ESAC in Spain. In addition to the above expertise work, APC and AIM laboratories also provided the flight calibration sources for the HXI telescopes based on Amicon 241 doped plastic scintillators. These sources are used to continuously calibrate the Detectors, and to detect possible drifts of their gain.